Passengers aboard two of our Akaroa Harbour Nature Cruises yesterday (Thursday November 30th) were delighted to spot three Hector’s Dolphin calves. 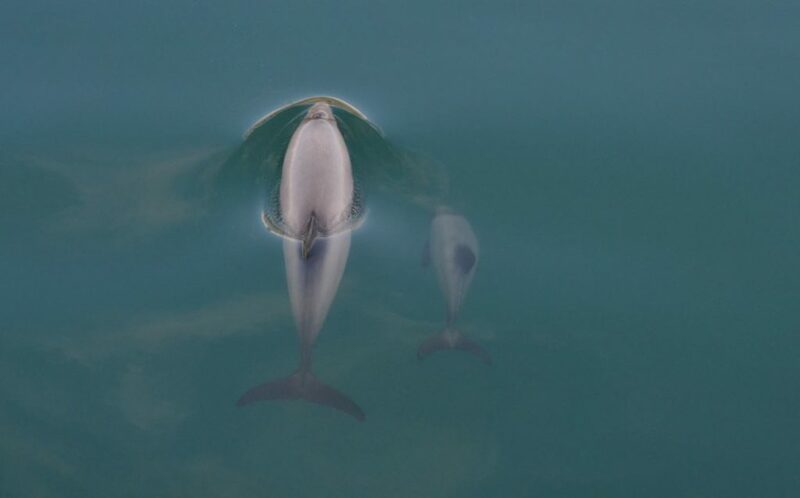 Black Cat Cruises crew and guests spotted two mothers with their baby calves just past Onuku Bay in Banks Peninsula’s Akaroa Harbour during the afternoon, after seeing a solo Hector’s Dolphin with its calf during the 9am cruise. On-board Black Cat photographer Jono Hitchcox estimates that the calves were less than two weeks old as the foetal folds on the calves’ skin could be seen. As SMART approved operators by the Department of Conservation (Sustainable Marine Mammal Actions in Recreation and Tourism) we ensure that we keep a safe distance from the dolphins and slow the boats down allowing them to approach us if they wish. We are very careful not to disturb their path as the mother and baby need to keep their strong bond. Females usually have one calf every two to three years. The calves are 50 to 60 centimetres long at birth and stay close to their mothers who provide them with milk and protection for about a year until they are old enough to fend for themselves. The calves will spend the next two years alongside their mothers before venturing off alone. Hector’s Dolphins are among the most endangered dolphins in the world. We feel so lucky that we get to view these rare and endangered species every single day and to share that experience with our local and international guests from all over the world! As Akaroa’s first daily nature cruise operator and only Qualmark Gold rated cruise operator we are strong advocates for the safety and sustainability of the dolphins. We donate a portion from all of our Akaroa ticket sales towards the education and research of these special marine mammals. Don’t forget we also offer Gift Vouchers for our Akaroa Harbour Nature Cruise and Swimming With Dolphins experience which would make such a unique perfect Christmas present! Call the Akaroa team on the number above to grab one today.